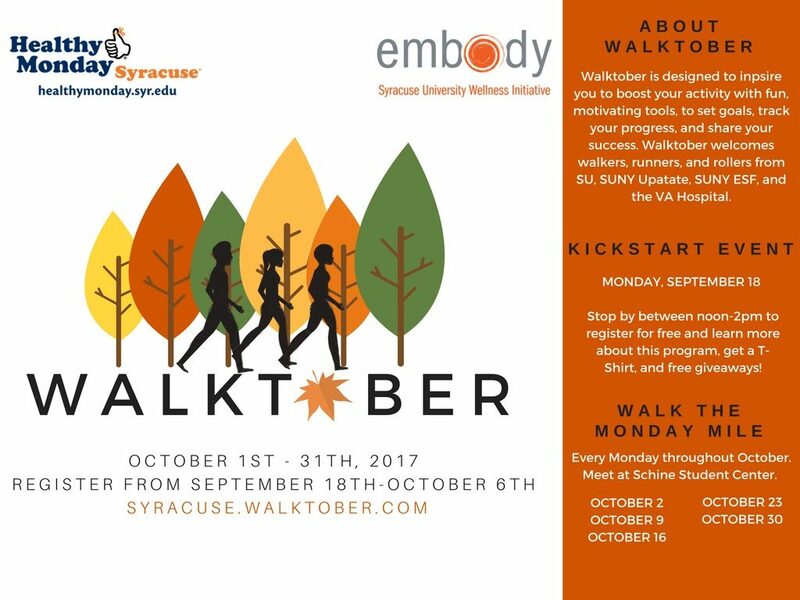 Walktober is a free, monthlong initiative and competition sponsored by Health Monday Syracuse and the University Wellness Initiative that encourages students, faculty, staff and family members of SU employees to step outside and take a walk. The event welcomes walkers, joggers, rollers, cyclist and all in between to track their physical activity from Oct. 1-31. Participants can stay motivated by viewing their progress, supporting their team members and fellow participants, and sharing their success stories. For further motivation, rewards will be offered to those who are most active and engage. Participants can track their physical activity each week and are encouraged to challenge themselves with weekly goals using online tools on the Walktober web platform and mobile app. The goal is to accumulate Walktober leaves by recording walking and other physical activity each day: 30-44 minutes (6000-7999 steps) equals a red leaf; 45-59 minutes (8000-9999 steps) earns an orange leaf; and 60-plus minutes (10,000+ steps) gains a gold leaf. Any combination of red, orange or gold counts toward the goal of 20 leaves for the 31-day program. Individuals and teams are also encouraged to use the various Monday Mile trails across campus, the City of Syracuse and Onondaga County. To kickoff the event, Healthy Monday is hosting a kickstart on Sept. 18 from 12-2 on the Shaw Quad. The kickoff will allow future participants to register, eat, win prizes and get a T-shirt. Following, every Monday of the month (Oct. 2, 9, 16, 23 and 30) all are welcome to join the Healthy Monday staff for a Monday Mile walk around campus. The walk will start at noon in front of Schine Student Center. All are welcome to register at syracuse.walktober.com starting Sept. 18.